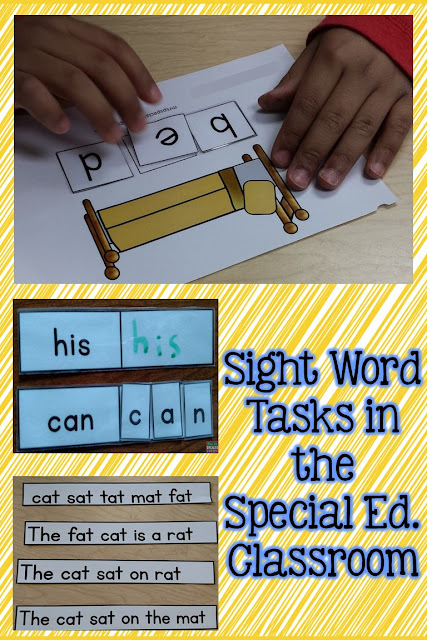 Ideas For Practicing Sight Words and Spelling | Mrs. P's Specialties! Special education students need a lot of repetition and practice in order to learn to read and spell sight words. Our kiddos need many hands on tasks in order to master reading and spelling sight words and retain the skill. We use these Sight Word Mats to practice reading high frequency words and then spelling. For my students that are able to, they copy the word with a dry erase marker. My non-writers still need practice, so they use letter pieces to spell the word. You can increase the rigor by adding in more letters that are not in the sight word. To make it easier, only put out the letters needed. These Sight Word Tasks are perfect for all of my kiddos and can be used in centers or work task boxes. We also work on understanding what the words mean. To practice sight words, reading and comprehension we use this Leveled CVC Word Building Set. I really like that all of my students can use this set- even my non-readers. For my non-readers, we work on matching letters and identifying pictures. I don't know about you, but I don't have tons of time to prep a million resources. I like resources that can be used with a variety of levels and skills. I can also adjust the rigor by increasing the number of letter options in the field of choices. We also practice reading the sight words fluently in short bursts. We use these Word Family Fluency Strips because they don't overwhelm my students. I have several students who get anxious when we move from sight words flash cards to books or short texts. 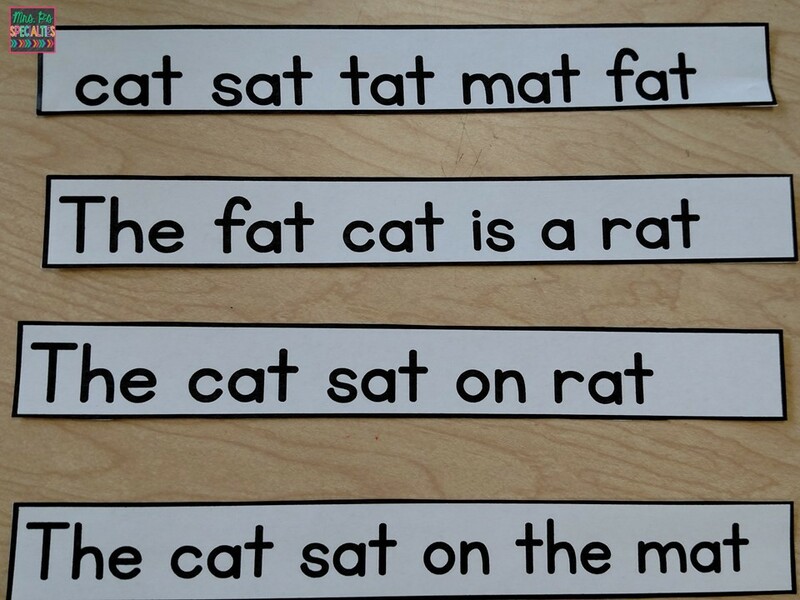 These strips help them transition away from reading single words. 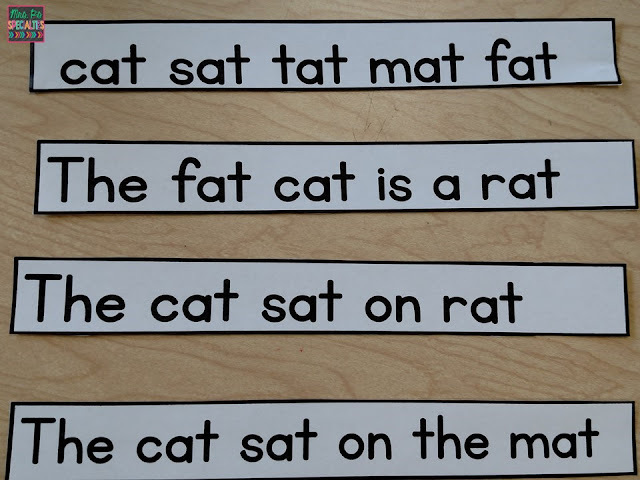 We also use these strips to practice punctuation, word families and listening comprehension. I give different verbal directions like, "Underline all of the rhyming words." or "Put the period at the end of the sentence." If students are struggling with reading fluently and want to sound everything out, we use these sound blending cards. Students first sound out the word letter by letter as they touch the circles under the letters. Then, the student slides their finger along the arrow while saying the sounds together fast. Sometimes we use the pictures to check for comprehension. If I know a student knows what the word means I turn it into a language building opportunity by asking questions like, "What category is it in?" "Tell me why you would wear it." If you are looking for more comprehension ideas, click HERE for more hands on ideas. Do you have a favorite way to work on spelling? Comment with it so we can all learn!